This ewer from Iran, dated 1180-1210, is composed of brass worked in repoussé and inlaid with silver and bitumen. New York Metropolitan Museum. Bitumen is a mixture of dark, sticky, highly viscous organic liquids composed mainly of aromatic hydrocarbons. It is usually black or dark brown in color. Bitumen found in nature is known as crude bitumen, and that obtained by the distillation of crude oil is called refined bitumen. It is now possible to produce bitumen from non-petroleum based renewable resources such as sugar, molasses, or starch. Materials that contain bitumen are described as bituminous, such as bituminous coal and bituminous rock. Bitumens are used primarily for paving roads. They have also been used for waterproofing products such as roofing felt and boats. Some have used bitumen plates to dampen the noise produced by moving computer parts (such as hard drives) and dishwashers. With the recent rise in oil prices, it has become profitable to upgrade bitumen to synthetic crude oil. Naturally occurring bitumens have served well for the preservation of plant and animal fossils. In British English, the word 'asphalt' refers to a mixture of mineral aggregate and bitumen (commonly known as tarmac). The word "tar," by contrast, refers to the black viscous material obtained from the destructive distillation of coal and is chemically distinct from bitumen. In American English, bitumen is referred to as "asphalt" or "asphalt cement" in engineering jargon. In Australian English, bitumen is sometimes used as the generic term for road surfaces. In Canadian English, the word bitumen is used to refer to the vast Canadian deposits of extremely heavy crude oil, while asphalt is used for the oil refinery product used to pave roads and manufacture roof shingles. Bitumen that has been diluted with naphtha (to make it flow in pipelines) is known as dilbit in the Canadian petroleum industry, while bitumen upgraded to synthetic crude oil is known as syncrude and syncrude blended with bitumen as synbit. 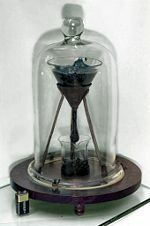 The pitch drop experiment at the University of Queensland, demonstrating the viscosity of bitumen. Bitumens are composed primarily of highly condensed polycyclic aromatic hydrocarbons. In addition, they contain several elements, a number of which are toxic. Examples of these elements are nickel, vanadium, lead, chromium, mercury, arsenic, and selenium. Bitumens are soluble in carbon disulfide, which is a nonpolar solvent. Crude bitumen is a thick, sticky, tar-like form of petroleum that must be heated or diluted before it will flow. At room temperature, it is much like cold molasses. Refined bitumen is the residual (bottom) fraction obtained through the fractional distillation of crude oil. It is the heaviest fraction and the one with the highest boiling point, boiling at 525 °C (977 °F). Given that bitumens are composed of hydrocarbons, they are flammable. For this reason, vessels for the heating of bitumen or bituminous materials are usually subject to specific conditions in public liability insurance policies, similar to those required for blow torches and welding and flame-cutting equipment. Naturally occurring deposits of bitumen were formed from the remains of ancient, microscopic algae and other organisms, after these remains were deposited in the mud on the bottom of the ocean or lake where they lived. It is thought that under the heat and pressure of burial deep in the earth, the remains were transformed into materials such as bitumen, kerogen, or petroleum. Bitumens have also been found in meteorites and Archean rocks. Based on this knowledge, scientists think it possible that some bitumens are primordial material formed during accretion of the Earth and reworked by bacteria that consume hydrocarbons. Bitumens are associated with lead-zinc mineralizations in Mississippi Valley type deposits. The two largest bitumen deposits in the world are located in Canada and Venezuela. The Athabasca Oil Sands in Alberta is the largest bitumen deposit in Canada and the only one accessible to surface mining, although recent technological breakthroughs have resulted in deeper deposits becoming available by in-situ methods. In Venezuela, the Orinoco Belt contains huge deposits of oil sands, known as the Orinoco Oil Sands or the Orinoco Tar Sands. The Canadian deposits cover 140,000 square kilometers (km²) (an area larger than England), giving it the second largest proven oil reserves in the world. This crude bitumen is the prime feedstock for petroleum production from tar sands (or oil sands) currently under development in Alberta. As of 2006, Canadian crude bitumen production averaged about 1.1 million barrels (170,000 m³) per day and was projected to rise to 4.4 million barrels (700,000 m³) per day by 2020. The total amount of crude bitumen in Alberta that could potentially be extracted is estimated to be about 310 billion barrels (50×109 m3). This amount, if used at a rate of 4.4 million barrels per day, would last about 200 years. The Venezuelan oil company Petróleos de Venezuela S.A. has estimated that the producible reserves of the Orinoco Belt are 236 billion barrels (37,500,000,000 m³). Other estimates goes as high as 300 billion barrels (48,000,000,000 m³). 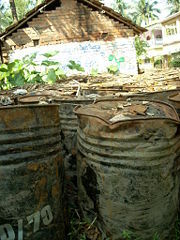 Bitumen cannisters for roadwork in Chakdaha, in the state of West Bengal, India. Bitumen is used primarily for paving roads. Its other uses are for bituminous waterproofing products, including the use of bitumen in the production of roofing felt and for sealing flat roofs. Because oil prices have been increasing since 2003, upgrading bitumen to synthetic crude oil has become highly profitable. In the past, bitumen was used to waterproof boats, and even as a coating for buildings (with some additives). The Greek historian Herodotus said hot bitumen was used as mortar in the walls of Babylon. It is also possible that the city of Carthage was easily burnt due to extensive use of bitumen in construction. Bitumen was also used in early photographic technology. It was most notably used by French scientist Joseph Nicéphore Niépce in the first picture ever taken. The bitumen used in his experiments was smeared on pewter plates and then exposed to light, thus making a black and white image. Thin bitumen plates are sometimes used by computer enthusiasts for silencing computer cases or noisy computer parts such as the hard drive. Bitumen layers are baked onto the outside of high-end dishwashers to provide sound insulation. Bitumen can now be made from non-petroleum based renewable resources such as sugar, molasses, and starches from rice, corn and potato. Bitumen can also be made from waste material by fractional distillation of used motor oil, which is otherwise sometimes disposed of by burning or dumping into landfills. Non-petroleum based bitumen binders can be made light-colored. Roads made with lighter-colored pitch absorb less heat from solar radiation. As a result, they do not become as hot as darker surfaces exposed to direct sunlight, reducing their contribution to the urban heat island effect. Bituminous coal is a relatively soft coal containing bitumen. It is an organic sedimentary rock formed by the diagenetic and submetamorphic compression of peat bog material. It is usually black, sometimes dark brown, often with well-defined bands of bright and dull material. The carbon content of bituminous coal is around 60-80 percent; the rest is composed of water, air, hydrogen, and sulfur. The quality of this coal is better than that of lignite but poorer than that of anthracite. Bituminous rocks are sedimentary rocks—such as shale, sandstone, or limestone—that contain traces of tar, bitumen, asphalt, petroleum, or carbon. They are also known as "carbonaceous rocks." ↑ 1.0 1.1 What is Oil Sands? Alberta Energy. Retrieved December 14, 2008. ↑ 2.0 2.1 2007 Canadian Crude Oil Forecast and Market Outlook. Canadian Association of Petroleum Producers. Retrieved December 14, 2008. ↑ Oil Sands - Glossary. Government of Alberta. Retrieved December 14, 2008. ↑ NIG Liability Insurance Proposal & Prospectus Primo Plc Insurance Brokers. Retrieved December 14, 2008. ↑ ST98-2007: Alberta’s Energy Reserves 2006 and Supply/Demand Outlook. Alberta Energy Resources Conservation Board. Retrieved December 14, 2008. ↑ Fox, Michael. May 9, 2006. Venezuela Increases Taxes on Oil Companies in Orinoco Oil Belt. Venezuelanalysis.com. Retrieved January 10, 2009. ↑ Herodotus, Book I, 179. ↑ Heat Island Effect. EPA. Retrieved December 14, 2008. This page was last modified on 10 June 2016, at 18:45.